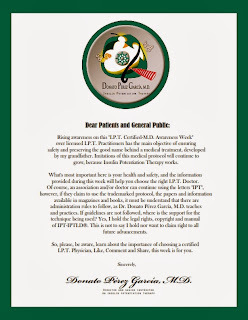 News from IPTLD & Dr.Donato Perez Garcia,MD : Dr.Donato's letter of Inauguration for the "I.P.T Certified-M.D. Awareness Week". 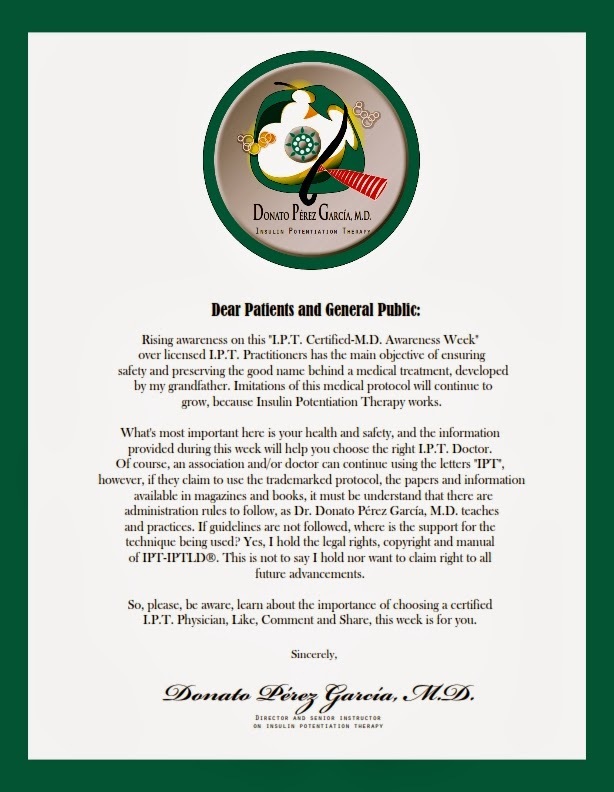 Dr.Donato's letter of Inauguration for the "I.P.T Certified-M.D. Awareness Week". Rising awareness on this "I.P.T. Certified-M.D. Awareness Week" over licensed I.P.T. Practitioners has the main objective of ensuring safety and preserving the good name behind a medical treatment, developed by my grandfather. Imitations of this medical protocol will continue to grow, because Insulin Potentiation Therapy works. What's most important here is your health and safety, and the information provided during this week will help you choose the right I.P.T. Doctor. Of course, an association and/or doctor can continue using the letters "IPT", however, if they claim to use the trademark protocol, the papers and information available in magazines and books, it must be understand that there are administration rules to follow, as Dr. Donato Pérez García, M.D. teaches and practices. If guidelines are not followed, where is the support for the technique being used? Yes, I hold the legal rights, copyright and manual or IPT-IPTLD®. This is not to say I hold nor want to claim right to all future advancements. So, please, be aware, learn about the importance of choosing a certified I.P.T. Physician. Like, Comment and Share, this week is for you.